North East Diary | Day 7 | Namdapha, hornbills galore! On 7th day morning, after breakfast we pack everything and move upwards to Bhool Bulaiah (BB) camp site. We start at 10 am and reach there at 10.40 am. This camp site is at 2500 feet above mean sea level. Earlier it was a view point but when the road was abandoned, the view point structure also fell down and now it had become a camping site. The distance was not much and it was an easy trek. Once at BB camp, we unload ourselves and go out exploring the jungle. We go down a little bit and there was a stream flowing with crystal clear water. Adjacent to the stream, there was a hot water spring and the water from that was white in colour. The water was only lukewarm and looked muddy, hence we could not take bath. The guide tells us that lots of animals come here to drink the water and that is why it was a view point. More is in store. We see some air bubbles coming out along with the hot water. 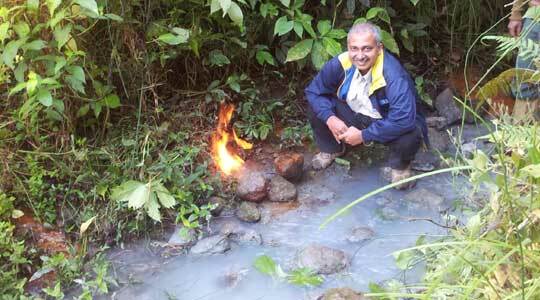 That is methane gas, I was told. And the guide started throwing match sticks there and it used to catch fire. We went down a little bit and there was another gas point. Here it was very easy to ignite the gas and the temperature of the fire was also more. The fire will remain like that, so with little bit difficulty we doused it off. We went exploring further and enjoyed every bit of the jungle. We had lunch and then went for exploring in a different direction and we could able to see lot of Hornbills. Later we had dinner and the day was over.